"Open your eyes... Wake up, Link..."
The game opens with Link waking up from a deep sleep, beckoned by a mysterious voice. The voice tells him that Hyrule needs its hero once more. Link receives a strange item called a Sheikah Slate, which serves as a guide to his quest, and sets out into the world with little more than the clothes on his back... which he has to find in a chest first. But Hyrule changed while Link slumbered. One hundred years ago, a great evil known as the Calamity Ganon appeared and ravaged the land. Unable to be defeated, it was sealed away in Hyrule Castle. The kingdom fell into ruin and nature slowly reclaimed what had been destroyed. While trapped within the castle, the Calamity Ganon has continued to grow in power, and it is up to Link to stop the beast before it breaks free and destroys the world. 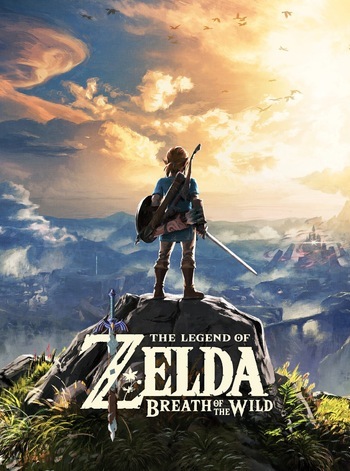 First revealed at Nintendo's 2014 E3 event, Breath of the Wild uses a Wide Open Sandbox element for its world, building on the similar open world setup reintroduced to the series in 2013's The Legend of Zelda: A Link Between Worldsnote and, in turn, the 1986 original. The game uses a cel-shaded art design mixed with realistic proportions just like Skyward Sword, but unlike Skyward Sword's post-impressionist style, Breath of the Wild's style is more reminiscent of Hayao Miyazaki films and gouache paintings. A large number of Monolith Soft employees (creators of another open world series, Xenoblade Chronicles) were brought in to assist on developing the game, in much larger numbers than were on the team that made Skyward Sword, and their Creator Thumbprint definitely shows in this game. Breath of the Wild is noteworthy for taking a departure from previous conventions of the franchise, incorporating a variety of RPG Elements from other open world games. Link now has to scavenge Hyrule for items, weapons, and equipment, as well as hunt, forage, and prepare food to restore his health. The world is much bigger than any other Zelda game before it, and Link can now climb any tree, building, or cliff with ease, giving players the chance to explore every nook, cranny, and mountaintop. Link can also find and equip a wide variety of weapons and armor, allowing a greater degree of customization than ever before. Another series first is that the game features extensive voice acting, not only in Japanese and English, but in all the other supported languages as well.note Spanish (both European and Latin American), French (both European and "Canadian"), German, Italian and Russian. The game was released worldwide on March 3, 2017 as a dual release for the Wii U and Nintendo Switch consoles, serving as the last first-party game for the former and one of the launch titles for the latter. Two DLC packs, which require an Expansion Pass, were released in the same year — the first, "The Master Trials" (released on June 30th), focuses on adding new gameplay challenges to the game, such as the Trial of the Sword, Hero's Path Mode, and Master Mode, while the second, "The Champions' Ballad" (released on December 7th during the VGAs), is a new story focusing on Princess Zelda and the Champions. The game also got a free update sidequest tying in with Xenoblade Chronicles 2, granting Link an outfit based on the one Rex wears in that game, courtesy of Monolith Soft due to their studio juggling the development of both games at once. On April 25, 2019, the game will be updated to support the Labo VR Kit, allowing the players to experience the full game with Nintendo's virtual reality solution. You have done well to reach the end of this page. In the name of the Goddess Hylia, I bestow upon you this Spirit Orb. May the goddess smile upon you. *rattle rattle* Yahaha! You found me!